I’m so happy that I got to take a great yoga class today after a 2 week hiatus. I don’t usually go 2 weeks without a class, but that’s what happened due to a slight setback in the healing of my ankle (sprained it 6 months ago) and being out of town last week for work. The best part of class for me today was Savasana, a resting or corpse pose for all you non yogis out there. This is the last pose and you don’t do anything. You just rest. After an exhausting week of travel and then having dealt with preparing for the pitch competition the week prior, it was just what I needed. 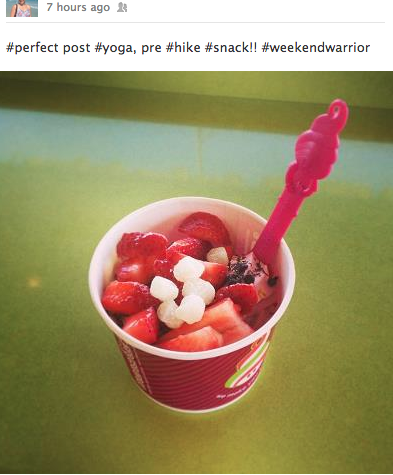 I also took a Savasana this weekend from Yoga-urt. Although I have a lot of little things to do like update my business plan, contact a few people, research a few investor groups, etc., I took the weekend off. It’s a little hard to get motivated after the pitch competition, but seeing the Facebook posting below from a fellow yogi (that I never told about my business), was a step in the right direction.